The last time I visited Edinburgh Castle, around ten years ago, it was a cold winter’s day and I virtually had the place to myself. Today was quite the opposite, with crowds filling all the spaces within the castle. It was hard to imagine what this place must be lucky on a busy summer’s day when the numbers increase by half as much again. I certainly don’t want to gain first hand experience of that! 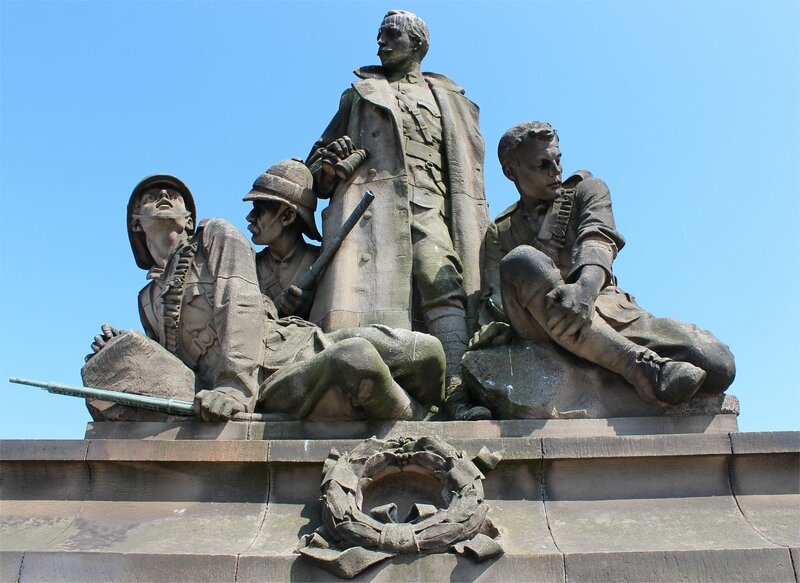 I never tire of seeing the Scottish National War Memorial, which is a beautiful space originally opened in 1927 as a commemoration of the lives of Scottish soldiers and soldiers in Scottish regiments who died in the First World War. The sight of Archangel Michael hanging over the casket holding the roll of honour in the shrine always takes my breath away. 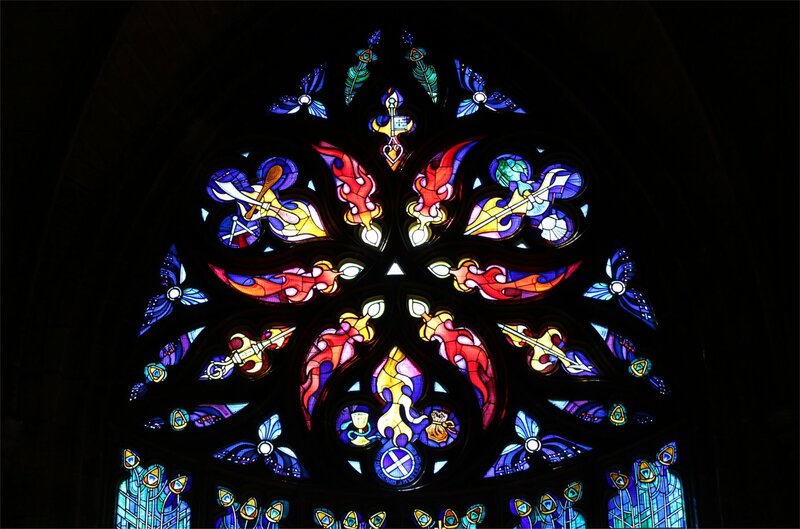 It is a wonderful symbol of hope for mankind amidst the terrible record of the lives lost through war. 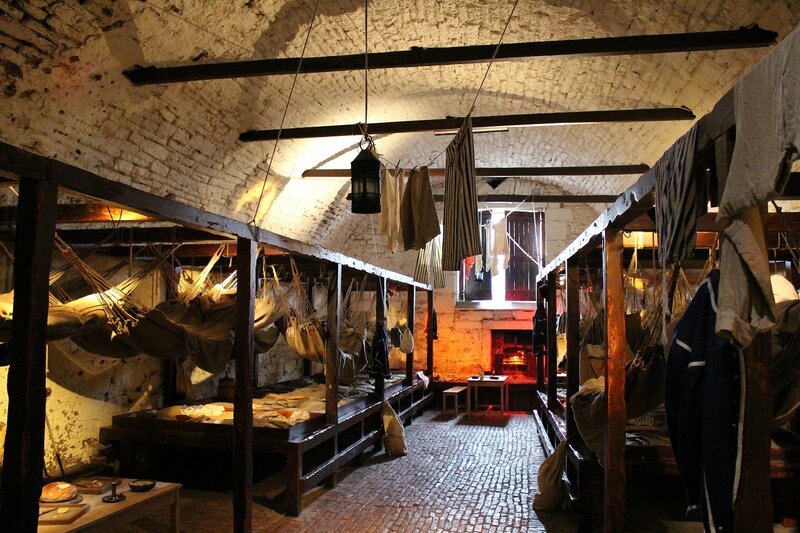 Since my last visit an exhibition (‘Prisons of War’) has opened which re-creates the conditions that American prisoners would have experienced in the stone vaults on 27th June 1781. It is wonderfully atmospheric and the snatches of conversation played around you give a good feel for the frustrations of life here. The associated exhibition space displays some remarkable doors which hold the scratched graffiti of the prisoners, including images of ships that they had served on. Our visit to the castle more or less ended with the daily firing of the One o’clock gun. 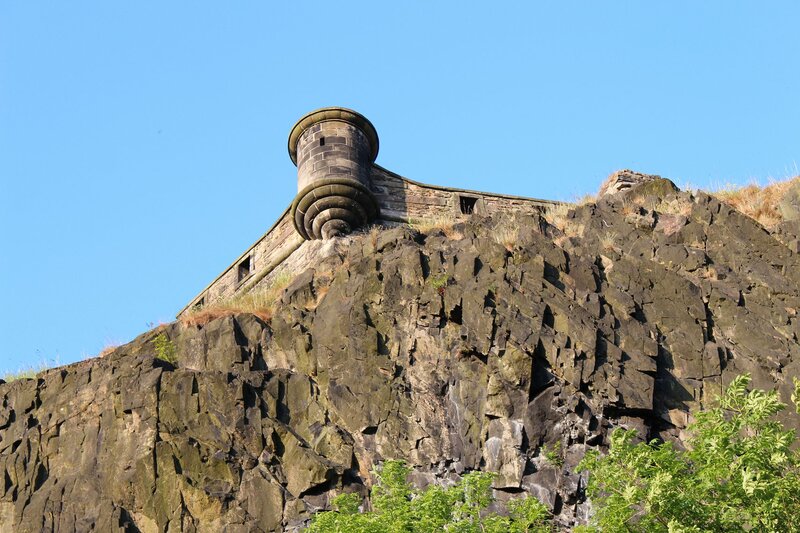 The gun is fired at the same time each day, although it has long since lost its purpose of providing ships in the Firth of Forth with a time signal to set their clocks by! 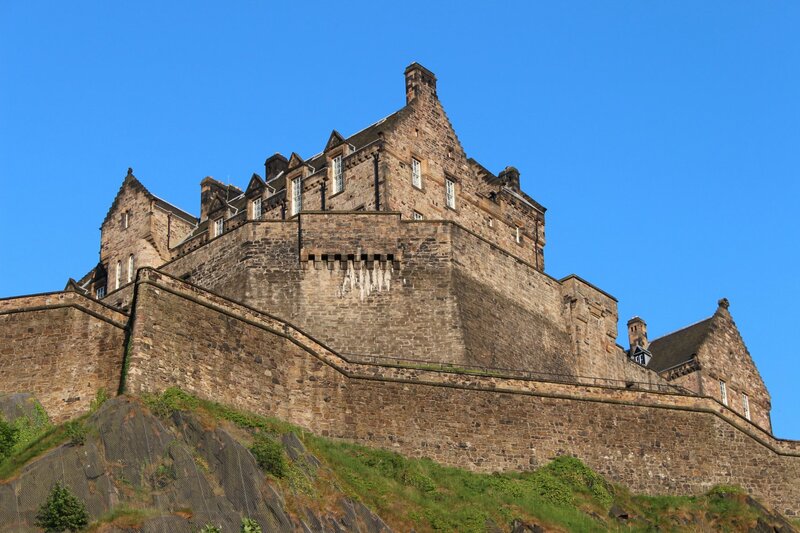 A 105mm field gun is used to create the signal and you certainly can’t miss it wherever you are in Edinburgh. 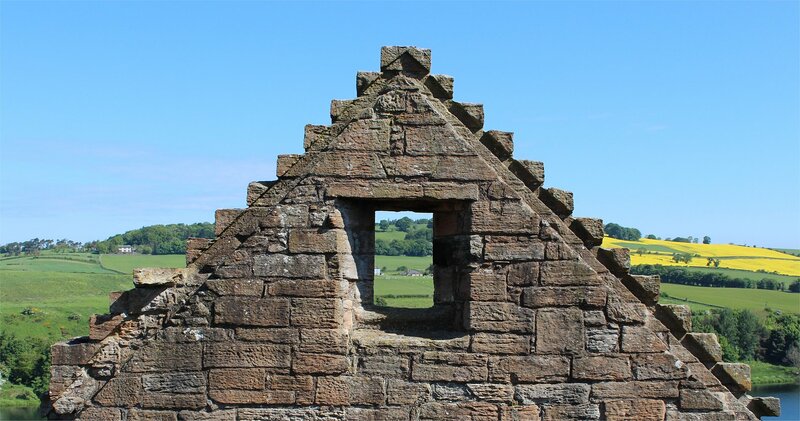 Unusually, today’s firing was being filmed as part of a Visit Scotland golf promotion – a soldier with a golf club took a swing followed seconds later by the firing of the gun. All very impressive. 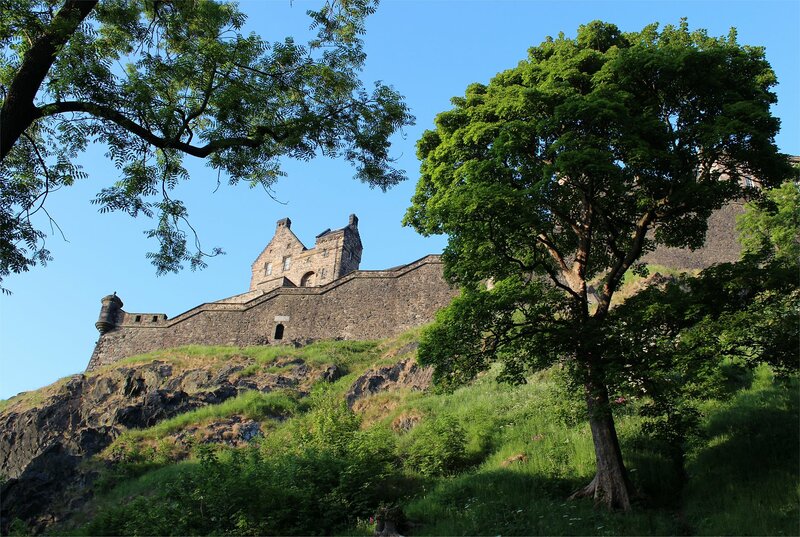 Edinburgh Castle is an amazing place to visit and once again we found that it is easy to underestimate the time that you need to take to explore the site. We easily spent a good three and a half hours wandering around but will still need to come back to do justice to the National War Museum which deserves a good hour or two in itself to appreciate fully. Another day, another castle! 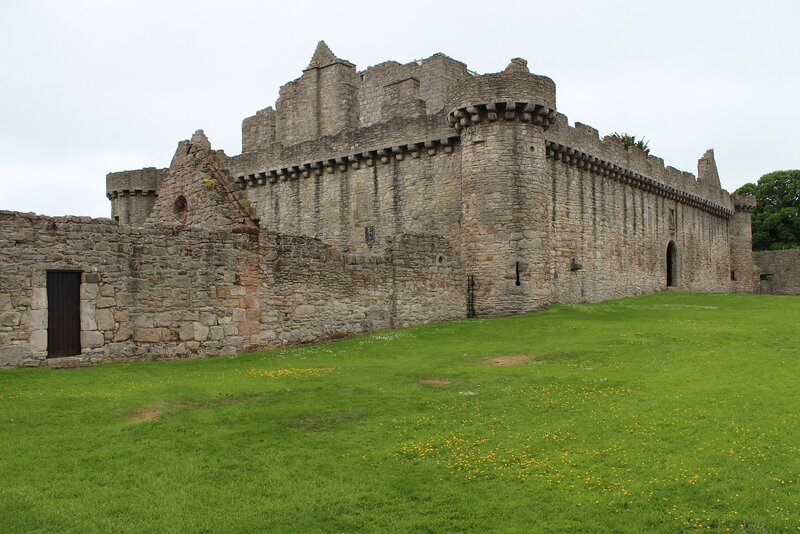 Today’s castle was at Craigmillar, in the south-eastern suburbs of Edinburgh. 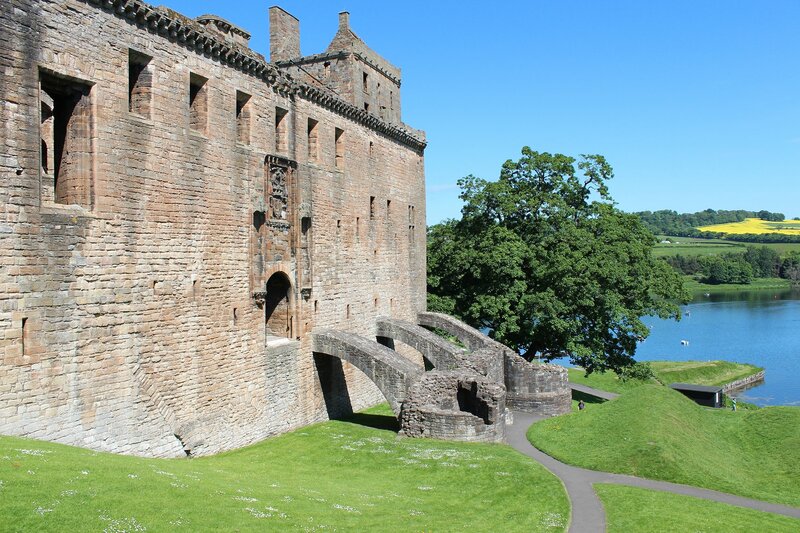 At one time the castle was a rural retreat, close enough to the city to be accessible but sufficiently set apart to offer Mary Queen of Scots some respite from bloody 16th century politics. As the bus timetables suggested we had a bit of a wait, we decided to take a walk to the castle. Although we probably didn’t gain anything from this, it offered an interesting stroll out of the city centre and took about an hour. 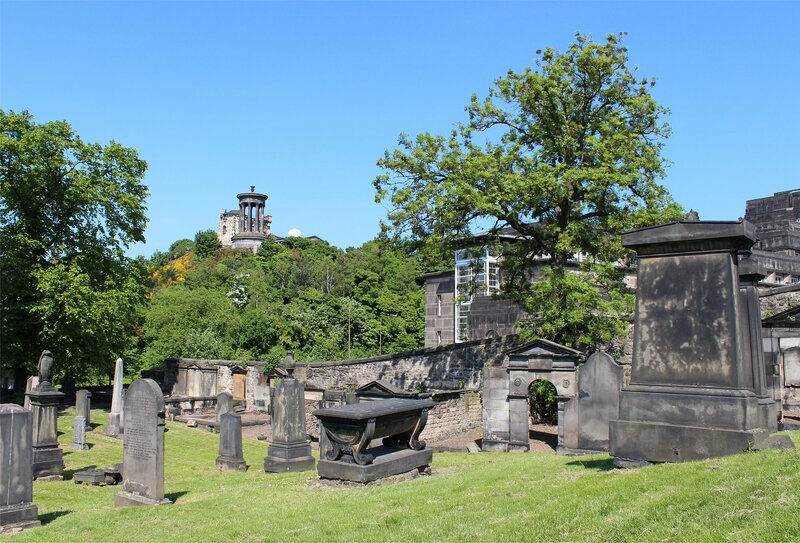 It made it all the more apparent that the castle sits amidst a sea of urban clutter, though the final section of the walk takes you into Craigmillar Country Park which goes some way towards preserving the illusion of the castle as a rural retreat. 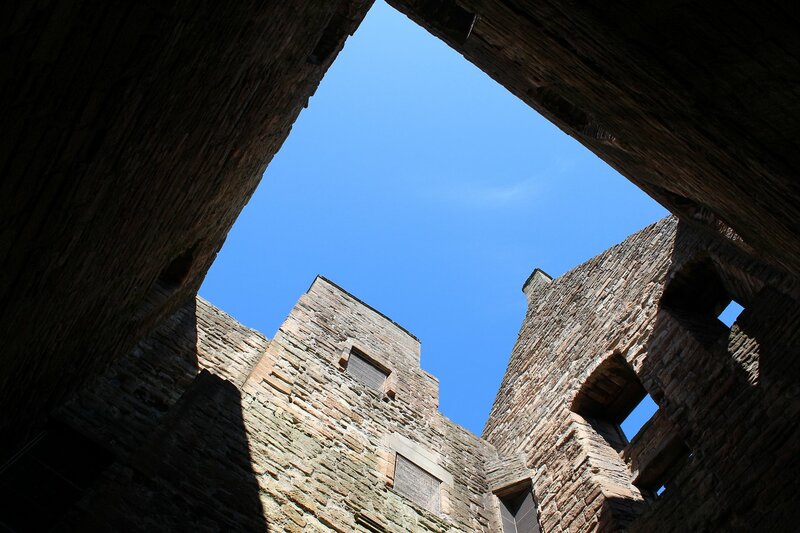 The castle itself is a fascinating and handsome sight, having progressed from the earliest phases of construction in the 14th century to become a more complex residence in the 16th century, before finally being reduced to a romantic ruin by the late 18th century. After taking a good look round we opted to take the bus (from the nearby Royal Infirmary at Little France) back into town. The afternoon saw us take a somewhat haphazard walk around Edinburgh, incorporating the Royal Mile and the annual exhibition at the Royal Scottish Academy (including a rather remarkable sculpture of a cheetah made from hundreds of wire coat hangers, entitled Spike). 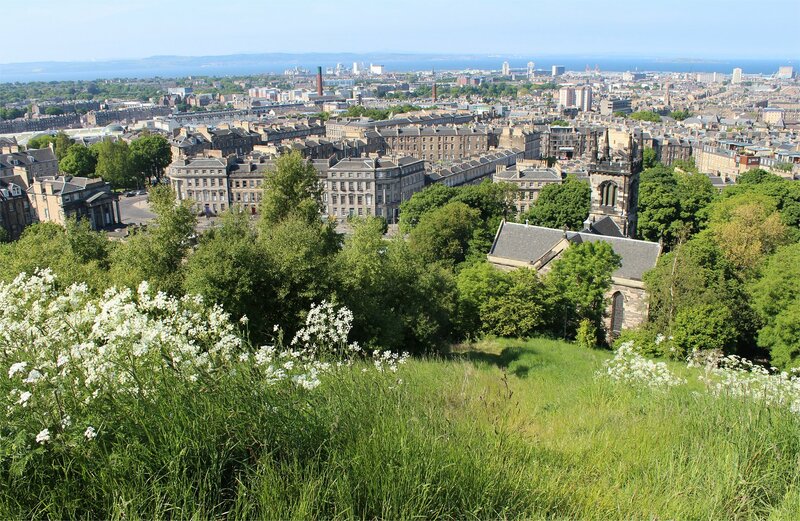 Finally, we made it to Calton Hill, which has to be one of my favourite spots in Edinburgh along with the nearby volcanic peak of Arthur’s Seat. 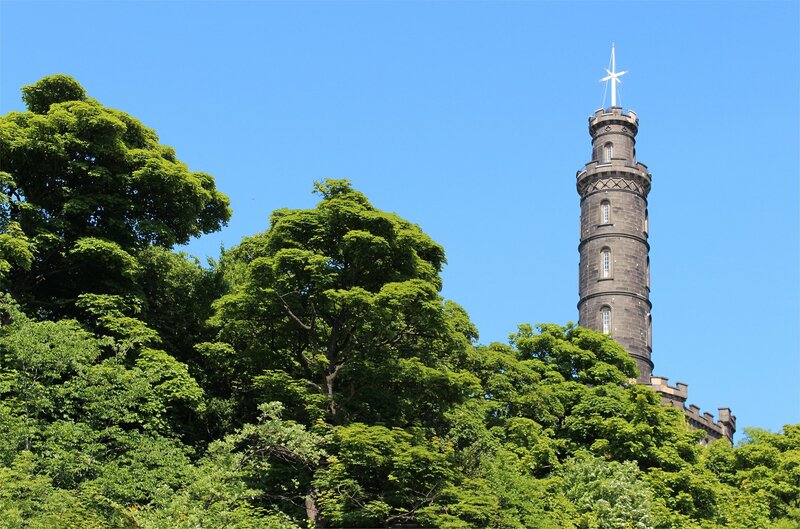 Calton Hill was one of the first public parks in the country. 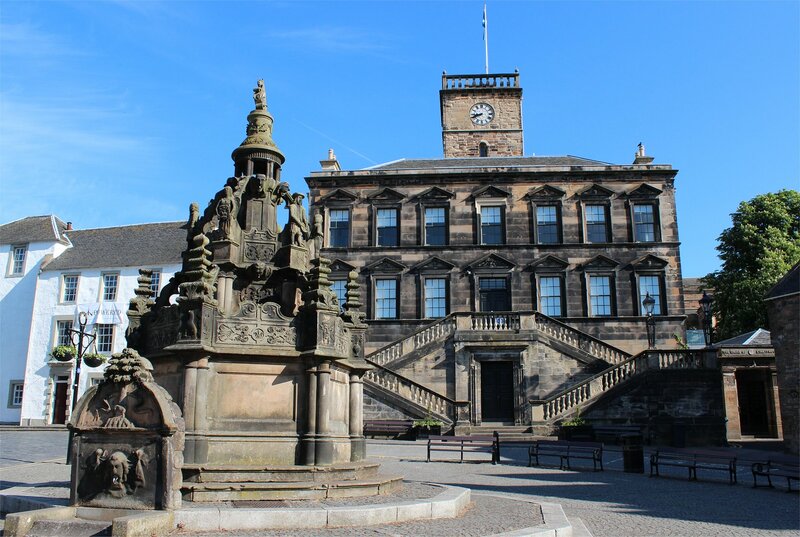 The philosopher David Hume was influential in persuading the council to build a walk ‘for the health and amusement of the inhabitants’ which you can still take today. 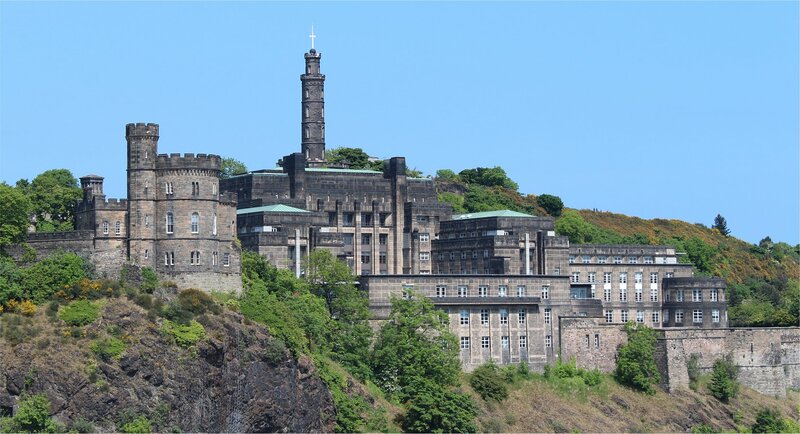 The eclectic mix of buildings at the top is part of its appeal to me – including the National Monument of Scotland (modelled on the Parthenon), the Nelson Monument and the Dugald Stewart Monument (modelled on the Choragic Monument of Lysicrates). 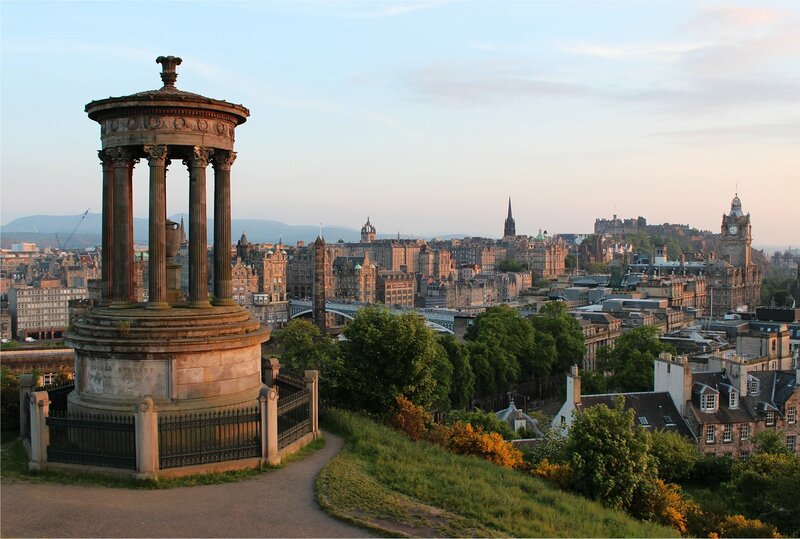 The sights of Calton Hill looked as magnificent as ever in the afternoon sun, though that didn’t stop me coming back at sunset (around 10pm) to join a string of photographers trying to grab that perfect shot of the city as the light died. It was never going to be a particularly original shot, but it was fun all the same! Travelling across town to Euston as midnight approached seemed more than a little strange, but once you are on board the Caledonian Sleeper all such thoughts disappear. The simplicity of falling asleep in London and waking up in Edinburgh on a bright sunny morning was enough to persuade me that this was the perfect way to start a four day trip to Scotland. The two berth cabins on the Caledonian Sleeper are certainly cosier than those of many sleeper trains that I have travelled on, but the comfortable bedding and convenience of a flip-up wash basin certainly make this a great way to maximise the time at your destination. The special ingredient on top of this arrangement were the charming hosts that greet you on your arrival at the carriage door and then do everything they can to make your journey work as smoothly as it should. The hosts help get you familiarised with the quirks of cabin life and stay on hand through the night if you need to get back after an early morning in the lounge car (it was reassuring to know that we could leave our baggage securely locked in our cabin if we wanted, though in practice we opted for sleep). 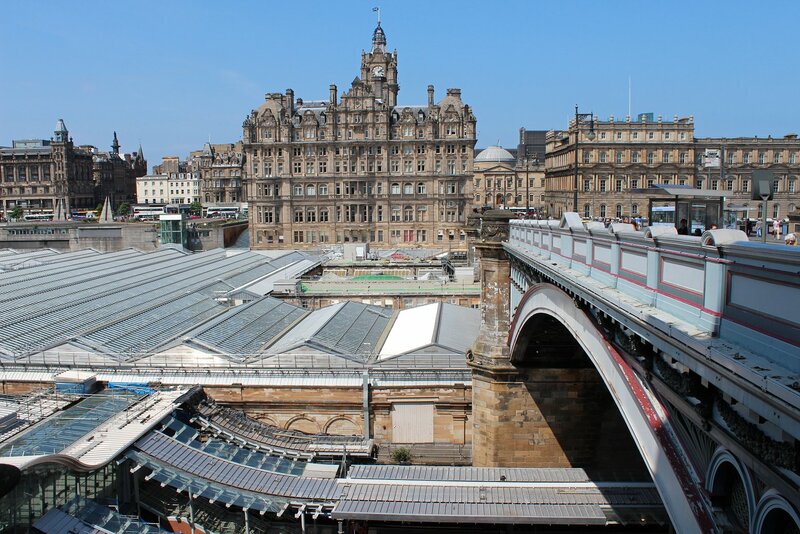 Our train arrived at Edinburgh Waverly on schedule at 7:22 in the morning, though you can remain in your berth until 7:45 which was sufficient to allow for a leisurely start. Coffee and shortbread had been delivered about half an hour before our arrival, so I felt surprisingly alert – though I wasn’t sure my sleepy cabin companion shared the same sentiments! Within the hour we were on our way again, travelling the short distance to Linlithgow by a local ScotRail service (around 20 minutes away). 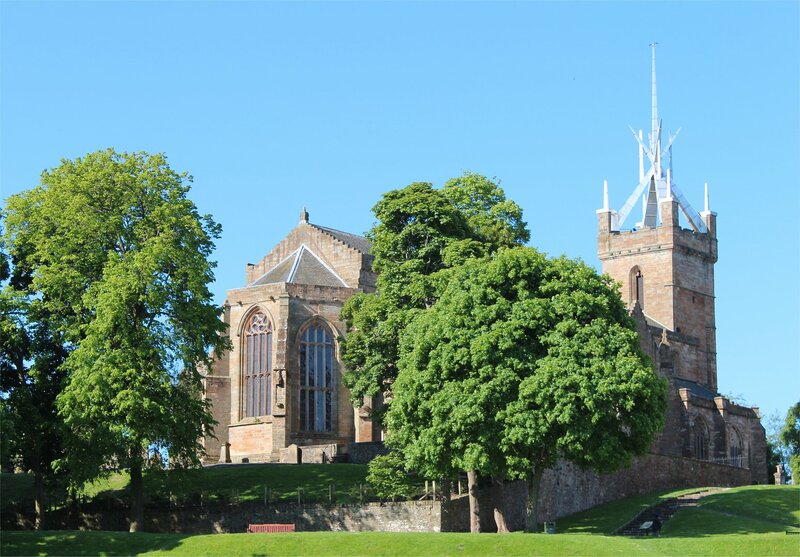 Linlithgow is most famous for the magnificent ruins of Linlithgow Palace, the birthplace of Mary Queen of Scots, though in truth the whole town was a delight with its historic streetscape and plethora of interesting buildings. 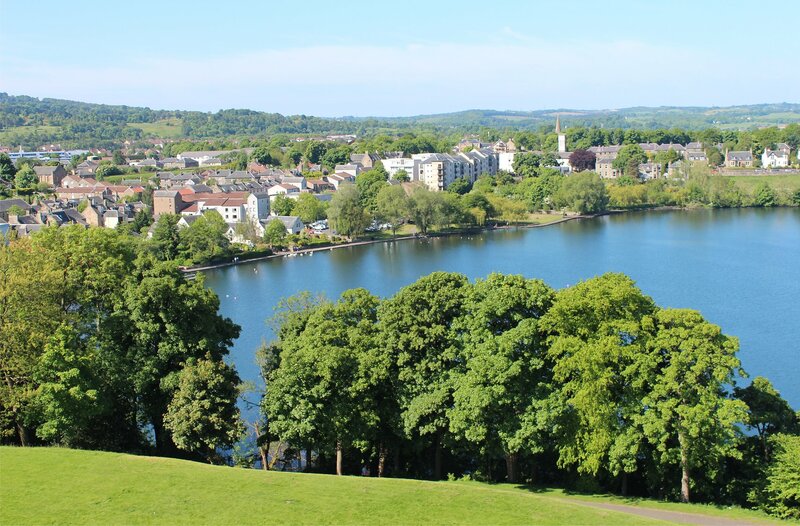 The Linlithgow Heritage Trail provides a handy guide to the local sights which we haphazardly followed. The most striking of the sights was Linlithgow Cross Well, which is an early nineteenth century replica of a much earlier well which had been destroyed during the occupation of the town by Oliver Cromwell’s forces in the 1650s. A short walk up from the cross brought us to the sixteenth century Palace gatehouse. 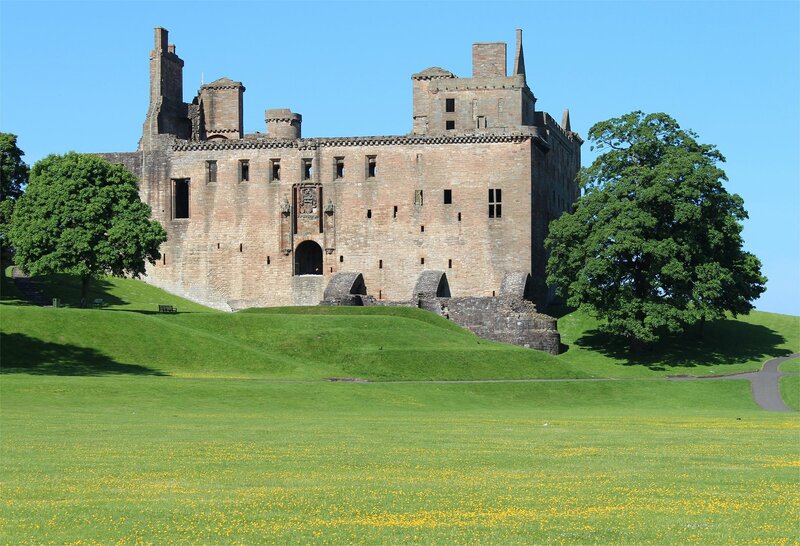 The setting for Linlithgow Palace is stunning. 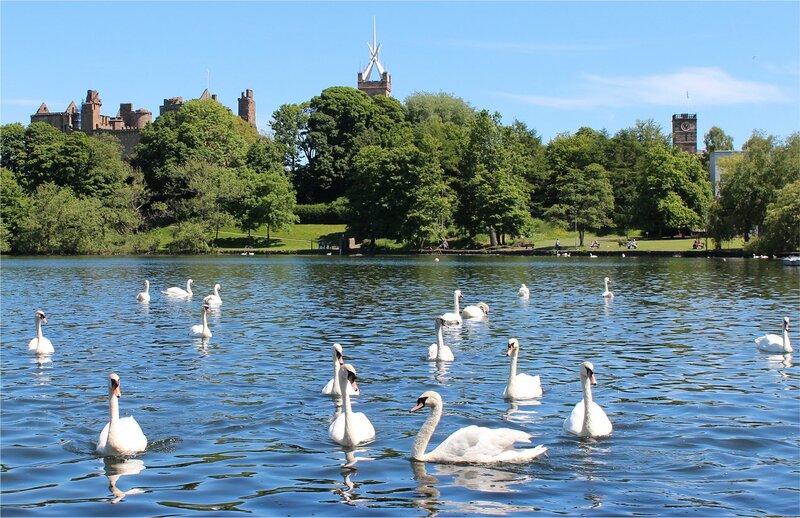 The Palace is beautifully complemented by the waters of Linlithgow Loch and the lusciously green park of Linlithgow Peel. The waters seemed like an oasis of calm with a few boats peacefully settled for a spot of fishing, apart from the occasional squawking of the loch’s swans to break the peace! The interior of the Palace is a wonderful, and sometimes bewildering, space to wander around. It is hard to visualise just how grand the rooms would have been in their time, but occasionally small traces of surviving ornamentation give you a clue – such as a unicorn carved into the ceiling of one room. 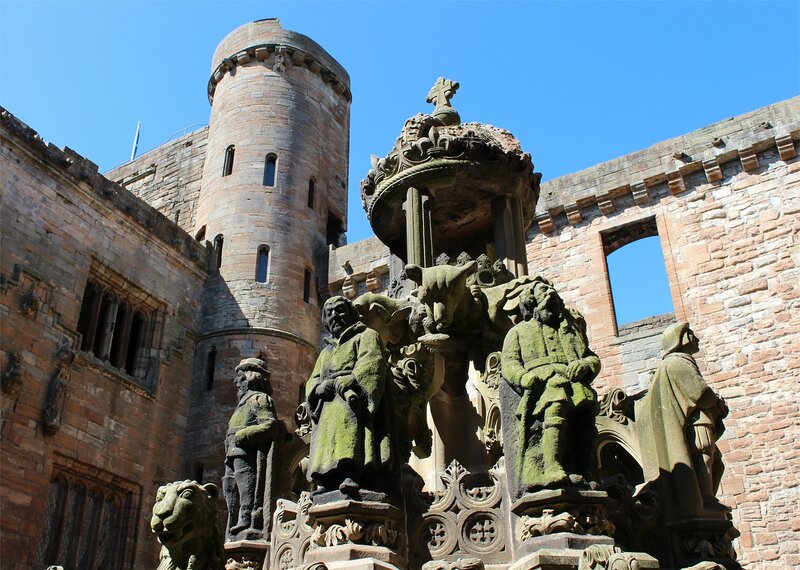 The highlight of the visit was, without any doubt, the ornate King’s Fountain which sits in the middle of the courtyard. The fountain was commissioned by James V in 1537 and is believed to be the oldest surviving fountain in the United Kingdom. 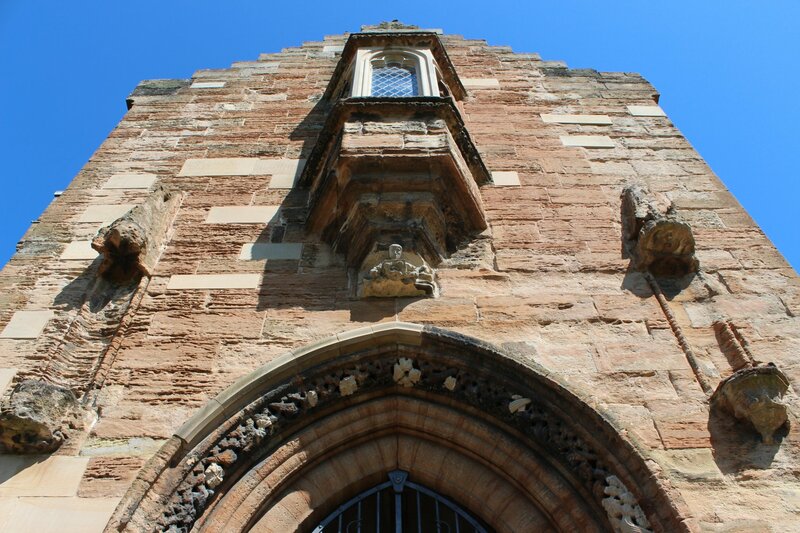 It was restored by Historic Scotland and continues to function to this day (although not on the day that we visited). After completing our tour of the Palace we visited the neighbouring medieval church of St Michael’s which holds its own place in history. 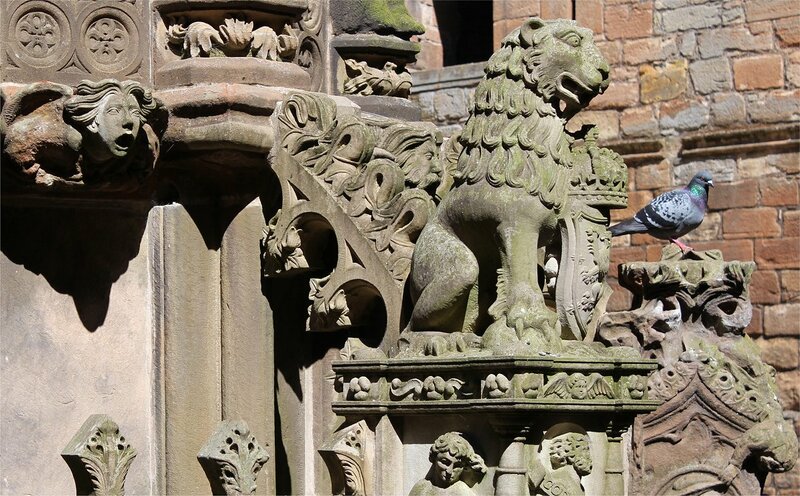 Mary Queen of Scots was baptised in the font at the church, although this – and all bar one of the statues in the church – did not survive the Scottish reformation. The church is hard to miss today with an unusual aluminium spire that was added in the 1960s. The final stop on our visit was the Old Post Office (1904) which has been converted to a pub. The building caught our eye from the outset and proved to be a good place to stop for refreshment before travelling onward. I got back into Edinburgh just after midday and had just under two hours for a wander. 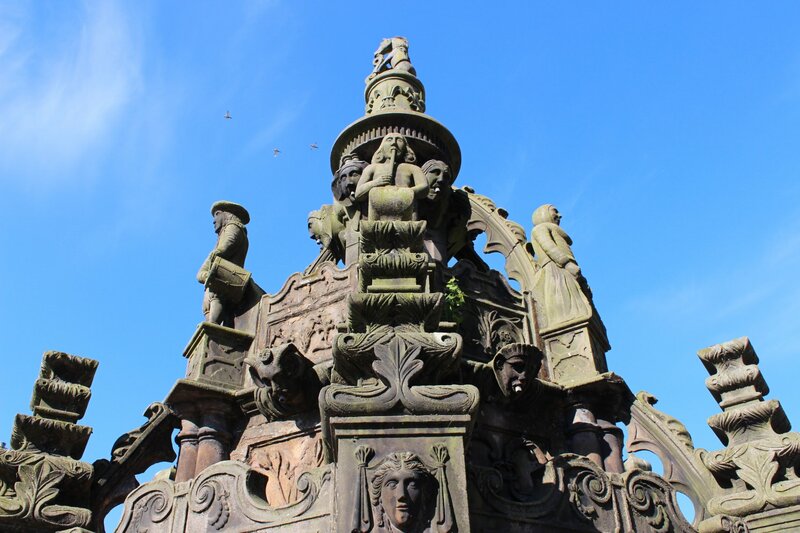 I visited the Scott monument for the first time (it had never been open on any of my previous visits to Edinburgh many years ago as it was undergoing restoration at the time) and then around the gardens. 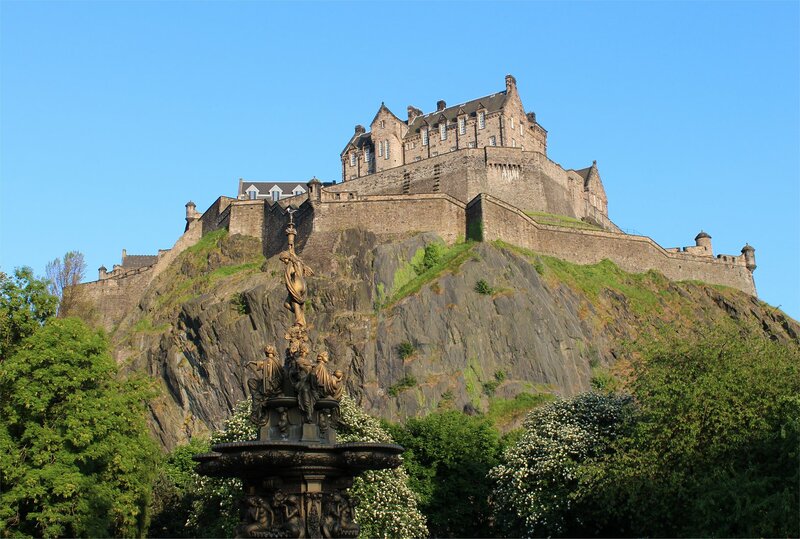 It is hard not to be seduced by the view up to the castle, particularly with a carpet of daffodils in bloom before it and I had a few attempts at catching that on camera. I had a pleasant wander around and then boarded the 13:50 ScotRail service to Inverness.